The ocelot, or Leopardus pardalis, was once described as a small leopard cat, an apt name considering its tawny coat speckled with black spots and a striped tail. Reaching only about 3 1/2 to 4 feet long, these cats are much smaller than many of the wildcat species in North America. In the United States, these small wildcats once inhabited Texas and Arizona in great numbers. It's also thought that they roamed into Arkansas and Louisiana as well. They also live in Central America, parts of Mexico and South America. Throughout this range, they inhabit almost every type of habitat from mangrove forests to thorny scrublands and grassland to marshes. Only during nighttime or especially cloudy days are they found in open areas. These spotted felines are predators to more than a few species of animals found in their native homes. Most of their diet -- 65 percent or so -- consists of nocturnal rodents. Medium-sized mammals such as opossums, squirrel monkeys and lesser anteaters are also prone to becoming dinner. In addition to mammals, reptiles, birds, crustaceans and fish are also a part of the ocelot diet. Due to their relatively compact size, ocelots are sometimes captured as prey themselves by larger predators in their home range. Harpy eagles delight in an ocelot meal, while larger cats such as pumas and jaguars will also take an ocelot if the chance arises. Anacondas are known to feast upon ocelots, as well. 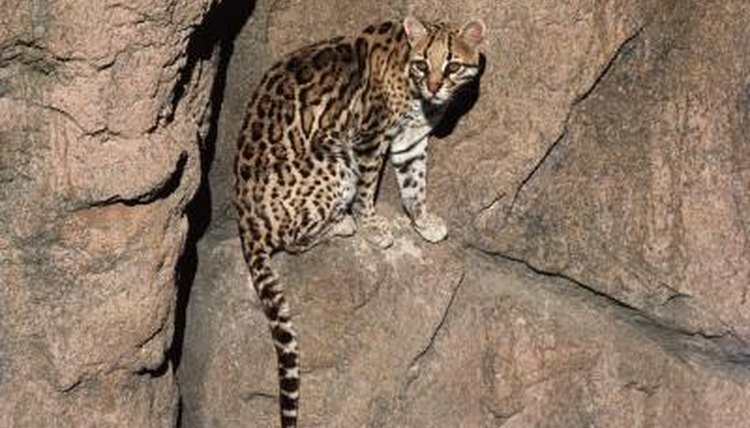 Ocelots made up the majority of the spotted-cat fur coats and other items from the early 1960s to the 1980s. The fur trade was an undeniable hit to the population of these medium-sized cats and one of the reasons they are considered endangered by the U.S. Fish and Wildlife Service. Today, their interactions with humans are rare in the United States due to their low numbers and nocturnal behavior, although a few specimens have been known to take domestic fowl as a food source when their area doesn't support sufficient prey populations. Some zoos are beginning captive breeding programs.